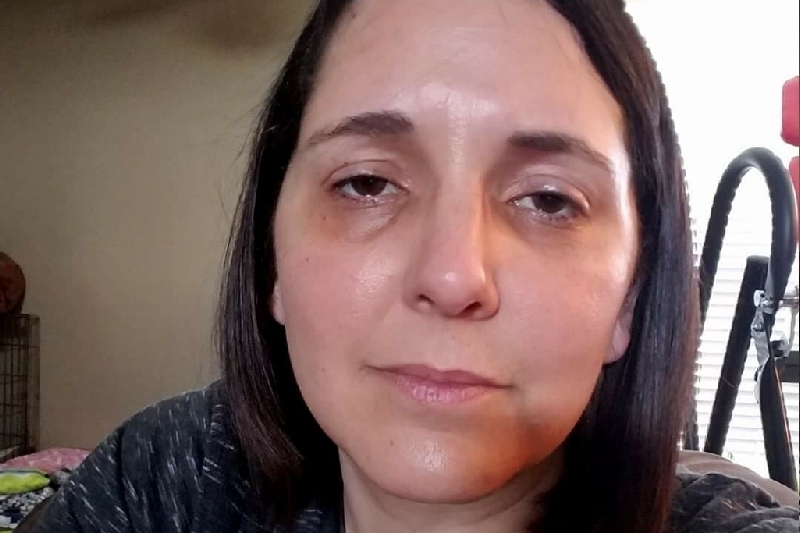 Fundraiser by Melissa Proctor Swanson : Melissa's Black Mold Fight! I've been trying to avoid sharing my story with my family and personal friends because I don't want everyone that knows me personally to know what's going on, but I really need prayers and support right now. As some of you know, I've been sick for a while with black mold toxicity. We moved to Texas last year when Justin retired, and so that I could be closer to the nearest doctor that would treat me, once I finally got a correct diagnosis. Unfortunately, Tricare (military insurance) will not cover treatment for mold toxicity, so it's been somewhat difficult for us. We were able to come up with the $7,000 for my first round of treatment (hyperbaric oxygen chamber therapy), through credit cards, which we're still paying for. In addition, I'm on a ton of medications and supplements, etc. (which run around $250/month or more). However, the bad news is that the first hyperbaric treatment didn't work. I have a genetic defect where I don't make the antibodies necessary to fight off the mold like the average person does. Well, I now need two more rounds, and it will cost approximately $16,000-$25,000 because I have to do longer sessions. There are constant lab fees, etc that insurance also won't cover. I could go on and on, but it will only allow a certain number of words in the GoFundMe opening story. If you can help, at all, it's greatly appreciated. If you can't but are willing to pray for our family, that appreciated just as much! I've posted one of my bills in the first update. I just wanted to update that I am changing back to going to hyperbaric more often due to symptoms. We'll get my toxin results some time in the next week or two to see if I need to go back to going every day. Its possible the good news last month was short lived, but I'll take it when I can get it. Right now I'm going to start 3 times/week. I'll update once I know the results. I also am having some possible liver related problems, so ill be having tests for that, including bloodwork and an ultrasound. Thank you everyone for your support. I'm getting a lot of private messages and comments on Emma's page and in private messages asking how I'm doing and why I'm not posting updates. So, here's what's going on. Btw, I sincerely appreciate everyone asking about how I'm doing. It means so much to me. You have no idea! This is a little long, but I haven't updated in quite a while. I haven't been updating much because I don't want to seem like I'm trying to get attention. That was never my intention, as I've said before. Since so many of you have shown me genuine concern and love, I do want to update. Please don't take this as me wanting anyone to feel sorry for me. Basically, due to the hurricane, there's was a gas shortage, so I had to stop going to treatment. I just started back today. As soon as I can pay for my latest toxin results, I'll be able to get those. They're about $300 each time, and I have to do them twice/month. Tricare won't pay for it, along with pretty much any of my treatment. If/when I get my toxin results, and they're still not good, I may be done with hyperbaric. This is not 100% though. The problem is, we're now out of resources, donations stopped (which I totally understand) and we owe so much money that it's putting too much stress on us financially. I'd rather just be sick. So unless some miracle happens, which is what it will require at this point, I'm probably done. It's just too much for a one income house, and I definitely can't work. If anyone knows of any miracles, send them my way, lol. Basically, I'd probably need up to another $30,000, maybe more, to fully be well, and that's no guarantee. This is not new territory for my doctor, but it's a little different due to some issues I have and the genetic anomaly, amount, type and concentration of exposure, etc., so it's hard to say how long it could take. I don't know what to do, so it's extremely hard not to lose hope after this long. I see all the mold patients come, do their 20 or 40 hours of treatment, some 80 hours, get better and leave. Two years later, I'm still doing it. I actually stopped counting how many hours I've done, but I'm sure it's close to 200. That's $40,000 out of pocket in just hyperbaric that we've spent. Plus around another $10,000 in uncovered lab fees and about $5,000 so far in over the counter supplements, etc. So, you can see why I'm saying a miracle is the only thing that's gonna get me the rest of the treatment I need. Most days I just sit in my car crying, trying to decide if I want to go in. I've called MANY doctors (all over the US), and the cost is pretty much the same. This is not an easy answer. The options are basically continue being sick, miserable and in pain, possible death (which I'm no longer afraid of) and possibly needing nursing care or a nursing home. A miracle could happen, and it could all just disappear, lol. I'm laughing because I know that won't happen. It's ok though. There's been a lot of prayer, and I don't think that's part of the plan for me. Truth is, noone really knows when exactly they'll die. As I said, I'm not scared. I'm sad for my kids and husband mostly. Until more is known about mold toxicity, it's neurological effects and effects on your organs, it's all a guessing game. Also, insurance companies will continue to ignore the illness and get away with not covering treatment. As much as I hate posting this again, here's ways that you can donate towards my care. The best way is to donate directly through PayPal and choose Family & Friends. That way I get 100% of the money. You can contact me for my PayPal information by sending me a message through the campaign. 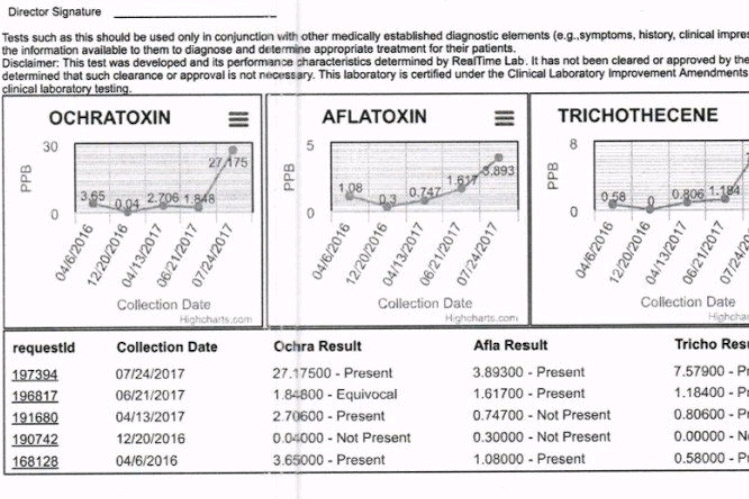 Well, I got my toxin results, and it's not good at all. It's higher than it's ever been. My doctor told me Monday that they should be going down by now. Instead, it looks like my body just can't fight it. I do still need to talk to him about it, but this is not what should be happening. I'm pretty upset. I kind of had a feeling this was going to be the outcome. Yes, I'm going to look into other options. If you think this is expensive, sending me somewhere else (or having to move again to where there's another doctor that will try something different) is going to kill us. Right now we're about $30,000 in the hole from medical bills. Depending on what my doctor says, I may just have to "call it". I'm tired and extremely frustrated. Please pray for my family and me. I feel defeated right now. I just wanted to post an update. 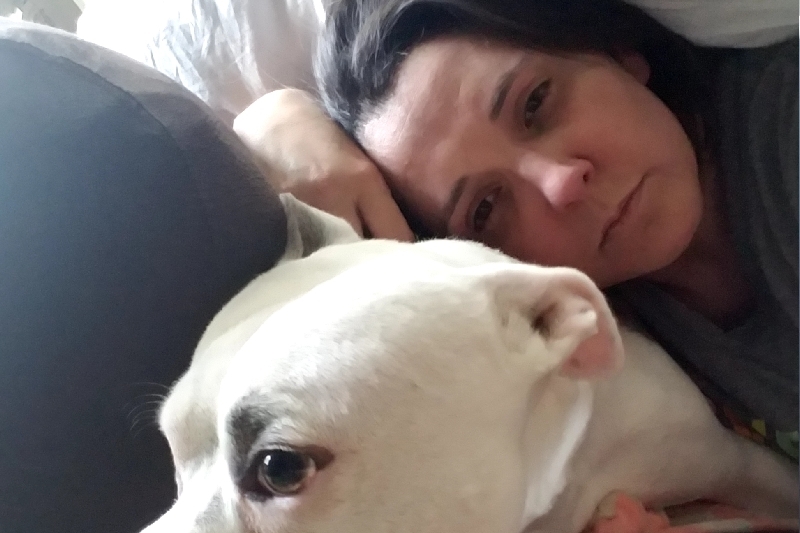 I took a week off from treatment, and it was nice. I've been back in treatment now for a week and a half. It's doing a number on me, as you can see by the pic, but hopefully it's working. 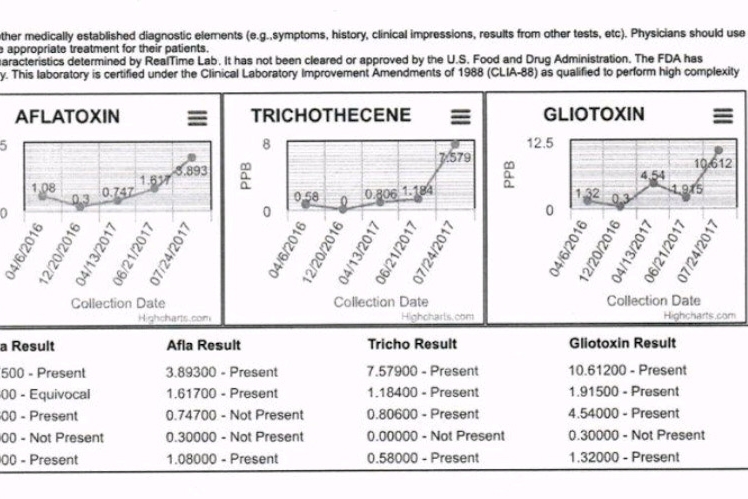 I wasn't able to get my toxins results to see if it's working because the lab no won't release my results to my doctor until I pay them $500 for the lab tests. It's ridiculous! That's another story. Now that we've put all the GoFundMe money on the hyperbaric treatments we owe, we're cash and credit card poor. So, we'll have to wait until we can come up with the money to see if the treatment is working. He's also saying it's likely I'll need to do it again. When you've been exposed to mold for 17 or so years, it takes a long time to get it out of your system. He's not taking advantage of me. Most patients with mold toxicity only have to do the 40 hours once. I'm on my 5th or 6th one, I think. Anyway, please continue to pray for me and my family. It's just as hard on them. I can't say that I'm not scared. I've been a nervous wreck waiting for my results. It's going to basically tell me if we should continue treatment or "call it" and just try to keep me comfortable.